Turns out that my speculation is, in fact, correct. It doesn’t just seem like way more kids have food allergies and sensitivities today than they did 25 or 30 years ago; they actually do. A 2011 study in the journal Pediatrics revealed that food allergies are on the rise among children. Today, it’s estimated that 8% of children under 18 suffer from food allergies; that percentage used to be closer to 2%, just a decade or two ago. And while experts believe that about 6 million children under 18 have food allergies today, just 3 million suffered from food allergies and sensitivities in 2007. Given those statistics, we know that it’s likely a fair number of you, our readers, are struggling with food allergies and sensitivities in your own home. For that reason, we’re dedicating today’s article to the topic of food allergies — specifically, how your baby or toddler’s food allergies may be affecting her sleep. This article is mainly about how your little one’s food allergies and sensitivities impact sleep, so we won’t get into a lengthy discussion about the details of food allergies and sensitivities here. For detailed information about signs of food allergies, types of food allergies, substitutes for common allergens, and tips for managing food allergies and sensitivities check out this series. Some symptoms of food allergies are so extreme, they’re hard to miss: vomiting, wheezing, widespread rash, etc. Other times, however, (especially when it comes to food sensitivities) the symptoms are far more subtle. And since food sensitivities sometimes cause delayed reactions, your child may not necessarily show any symptoms for hours, or even a day or two, after eating a particular food. Daytime Drowsiness: It might be odd to consider drowsiness a problem for babies and toddlers; I know many of you would love it if your little one were nice and drowsy at naptime or bedtime! But the kind of drowsiness that a food allergy or sensitivity produces is more of a “brain fog” kind of drowsiness. You may notice that your baby seems especially sluggish, or that your toddler seems “fuzzy” and unable to focus. And this “brain fog” may not manifest until hours after mealtime. Nap Time / Bedtime Sleeplessness: Usually, the lack of sleep related to food allergies or sensitivities can be traced to digestive issues — gas, or indigestion, may make your baby or toddler too uncomfortable to relax and fall asleep. Food allergies and sensitivities can also cause other problems, like ear infections, that can then produce sleeplessness. While sleeplessness is a common side-effect of food allergies and sensitivities, we often don’t recognize it as such. We tend to chalk sleeplessness in our babies and toddlers up to problems like teething, or sleep associations. And while those are definite causes of nighttime waking and nap time drama, it’s helpful to remember that food allergies may be at the heart of a baby’s or toddler’s sleep problems. Case in point: a UK study revealed that in a group of 13 month old babies who were waking often at night for no apparent reason, the majority of them slept significantly better when they were taken off cow’s milk and milk products. Hi Nicole! I have been reading your newsletters and using your site for a few months. It really does help (especially in the middle of the night) to know that others are having the same problems. My son, who is now 7 months started to become a difficult sleeper around 3.5 months- overnight and at naptime. I nurse him to sleep and was having to do so every couple of hours. He would also only nap if I was holding him or walking him in the stroller. After he had a reaction to eating yogurt, we discovered that he is allergic to milk. While he was not having severe symptoms from the milk products in my breast milk, such as blood in stool and rashes, it seems he was becoming very gassy and likely had stomach pains. Since I have removed dairy from my diet, he has been exponentially better at sleeping. I can put him down awake in the crib and he will nap for 2 hours! Twice a day! The best surprise came last night when he slept for 9 straight hours! It is very difficult to avoid dairy- it is found in surprising places. We even discovered that the infant toothpaste we were using on him twice a day contained milk products! While I know that this is not likely the case for everyone, I thought I would share with you. Maybe even one other sleep deprived mom could benefit. Again, this article is mainly about sleep, so we won’t get into all the ins-and-outs of managing food allergies here. For details about how to handle your little one’s food allergies and sensitivities, check out this article. …switching to a new formula. If your feed your baby formula, and you suspect that she may have a milk allergy or sensitivity, you can switch to a hypoallergenic formula. However, make sure that you discuss any formula changes with your baby’s healthcare provider before taking action. A doctor will be able to provide recommendations that are tailored to your baby’s unique needs. …modifying what you eat, if you breastfeed. Remember, the foods that you eat pass into your breast milk. If you suspect that your baby has an allergy to a specific food (like dairy, for instance), remove that food from your diet. Read more information here. …trying an elimination diet. This will work for toddlers, and for babies who are eating solids. If you think that a specific food is causing sleep problems, eliminate that food and then watch your baby or toddler closely to see if his sleep improves. It’s also important to note that it may be difficult to test for a food sensitivity which is why an elimination diet can be helpful in finding out what foods your baby or toddler might be sensitive to and which they may outgrow as they get older. Remember, before taking any of the steps listed above, you should talk to your baby’s healthcare provider. 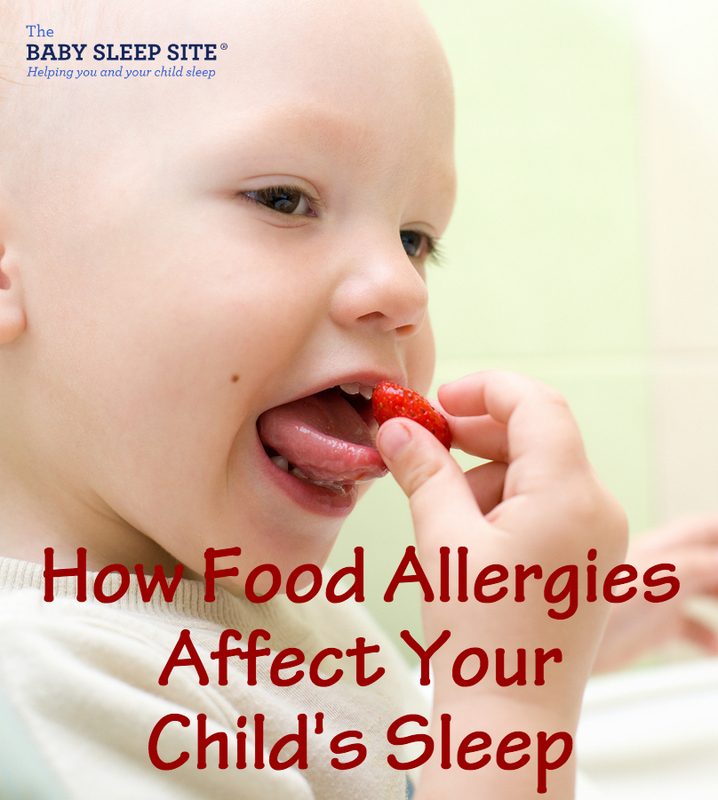 Of course, a food allergy may not be to blame for your little one’s sleep issues. If that’s the case, we can help with that, too! If you need help getting your baby to sleep through the night, or help teaching your toddler better sleeping habits, we’re here for you. Same goes for naps — we have the resources you need to get your baby or toddler on a good daytime schedule. Does your baby or toddler struggle with food allergies or sensitivities? How are you managing them? Any tips to offer other parents? Food Allergies is such a critical topic, thanks for sharing such useful information, it helped me a lot with my boy.